Los Angeles offers many picturesque locations for outdoor weddings and photo shoots. 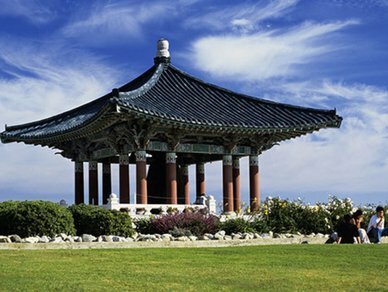 One of the most beautiful that comes to my mind is the Korean Friendship Bell located where Gaffey St. meets the Pacific Ocean in San Pedro, CA. The bell, situated on a bluff that overlooks the ocean and the Port of Los Angeles, was presented by the Republic of Korea to the American people to celebrate the bicentennial of the United States, to honor American veterans of the Korean War and to symbolize friendship between the two nations. The effort was coordinated by Philip Ahn, a Korean-American actor. It was dedicated on October 3, 1976 and declared Los Angeles Historic-Cultural Monument No. 187 in 1978 (Wikipedia). Because of its beauty it is a popular wedding site in Los Angeles County, however in my personal opinion the winds are usually so high that guests might have a hard time hearing the ceremony. Therefore I would suggest it as a site for post wedding photos. Please click here for more information if you’d like to have your wedding at this historic and cultural site.